I have driven by this very busy traffic island in Bahrain’s Salmabad area scores of times but this shot from on board a helicopter presented an entirely different, and surreal look. 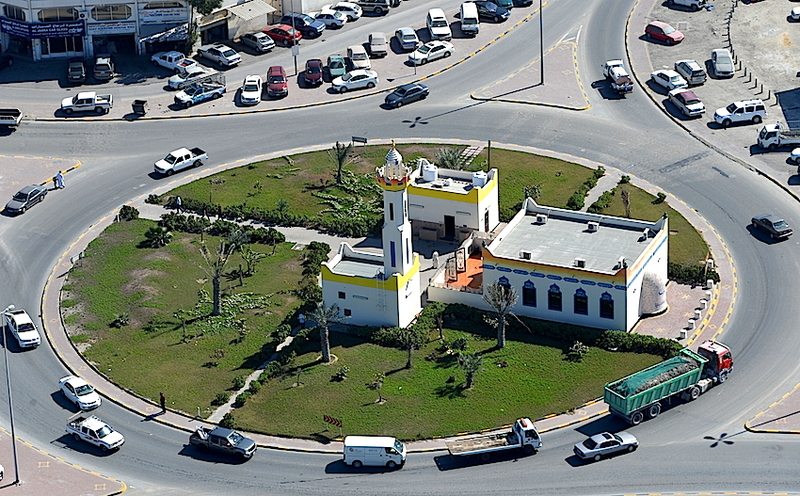 I cannot for the world of me figure out how a mosque came up ON this roundabout and attracts thousands of worshipers. To top it all, there is no traffic light – a RED signal – that gets traffic to halt for a moment so the devout can safely cross over. Well, as they say, it’s truly divine intervention and nothing else! Things that you only see in Bahrain. Well, indeed it is a lovely shot! You are lucky to get an aerial view. I wasn’t v surprised to see the mosque on the roundabout; India has places for the devout in the most unlikeliest of places. There is a Dargah Sharif bang in the middle of a highway near Chandimandir in Chandigarh. I believe you know that area well. Oh yes. India is something else. Even in Chandigarh city, there are shrines under trees and in the corner of a bus shelter!